Page last updated on: Saturday, 13 October, 2018. 1. "Fie" Hughan, 2. Jim Hughan, 3. "Lexie" Hughan, 4. Tom Slater, 5. "Tot" Hughan, 6. Jack Wallace, 7. Mary Agnes Mitchell, 8. "Dolly" Hughan, 9. R A Mitchell, 10. "Teenie" Wallace, 11. Rev. John Stewart, 12. George F Marrison, 13. Cecil Slack, 14. Wilfred Marrison, 15. Katie Hughan, 16. Alice Hughan, 17. Hilda Marrison, 18. Jack Wallace jnr, 19. Norval M Hughan, 20. Margaret Hughan, 21. Miss Hume. 1. Rev. John Stewart (Girthon), 3. Thomas Craig, 5. Mrs Elizabeth Craig, 6. Ted Cossar (draper, Lockerbie), 9. Mrs Elizabeth Cossar (nee Craig), 10. Dr Alexander Craig. 10. Dr Alexander Craig, 11. Mrs Mather, 12. Mary Mather (nee Craig), 13. Arthur Mather (farmer, Hangingshaw, Lockerbie), 19. Dr William Craig (Dumfries), 20. Jean Mather, 21. Mrs Jenny Craig (nee Gibb), 22. William Mather (farmer Dinwoodie Mains, Lockerbie). 1. Jay Crosbie (sister), 2. ?, 3. ?, 4. Jessie Crosbie (mother), 5. Rev.John Stewart, 6. Jennie Crosbie, 7. Christopher Crosbie, 8. William Crosbie, 9. George Crosbie, 10. Hannah Crosbie, 11. Joyce Crosbie, 12. Emma Crosbie, 13. John (Jack) Crosbie. 1. Mary Crosbie, 2. Evelyn Tait , 3. Jack Tait , 4. Annie Tait , 5. Dorothy McAdam, 6. Robert Tait, 7. William Crosbie, 8. Tom Tait, 9. Nick Crosbie, 10. Elizabeth Tait, 11. James (Bosey) Sinclair, 12. Maggie Jane (Peg) Sinclair. 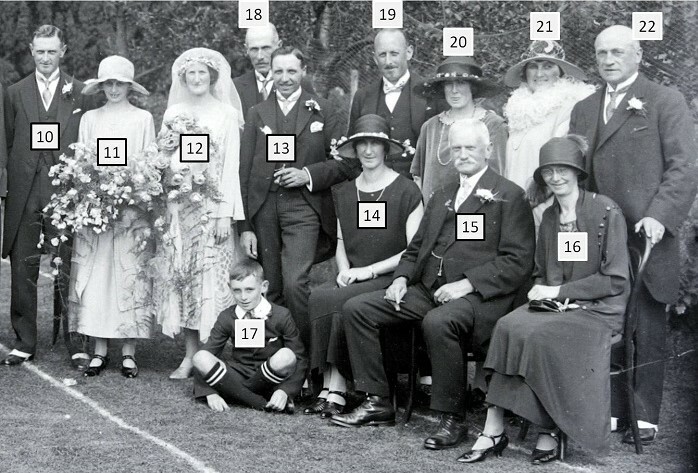 Mr James Cain, 24 Fleet Street, Gatehouse of Fleet, married Miss Elsie Howard from Lincoln in 1931. 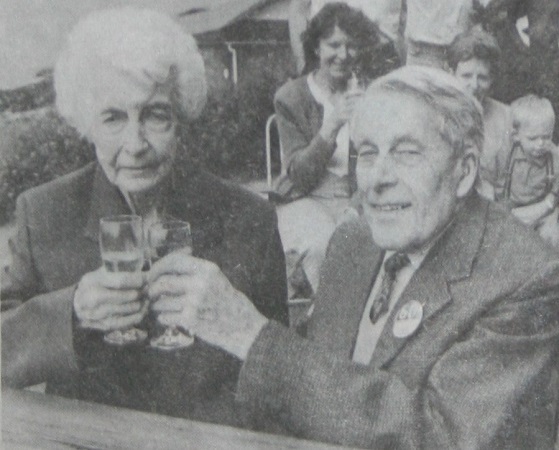 They celebrated their golden wedding in 1981. 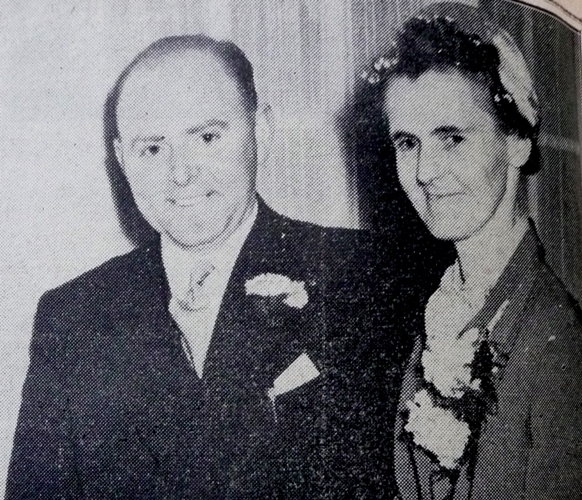 Mr James Johnstone (Jim) Kelly, from Garlieston, married Nellie Hay, from Gatehouse in 1933. Jim worked for Smith & Murray, joiners & undertakers. 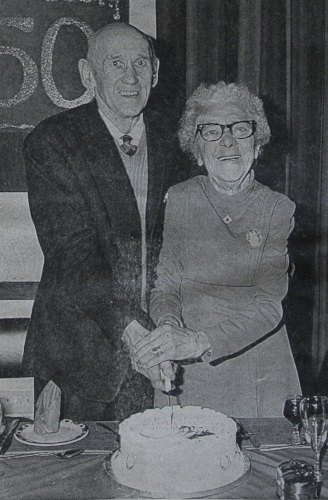 Cutting a cake to celebrate their golden wedding anniversary are Charles Smith McCulloch and Jessie Gilchrist Gemmell who were married on 28 November 1935. 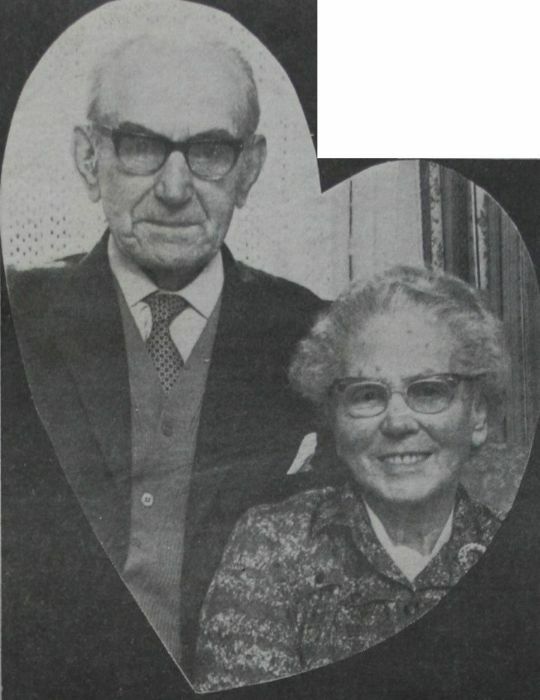 Adam Ferguson, from Castle Douglas, & Isabella Fraser were married in Creetown on 14th February 1936. 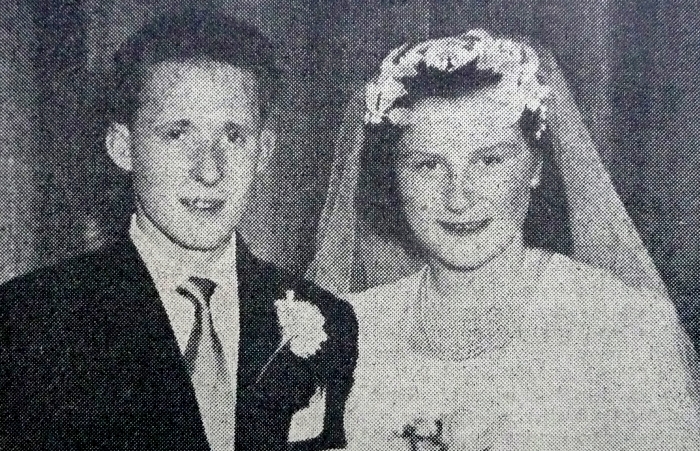 At the time of their golden wedding anniversary they lived at 15 Catherine Street, Gatehouse. 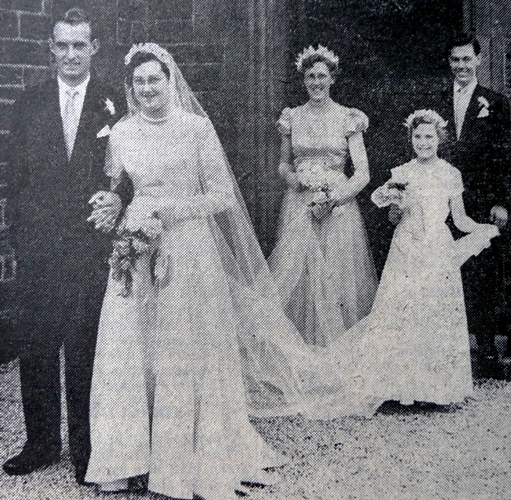 The bridal party leaving Kirkmahoe Church after the wedding of Miss Nan Chisholm, Thirwell House, Locharbriggs, and corporal David Campbell, Cuill Cottage, Rusko, Gatehouse. 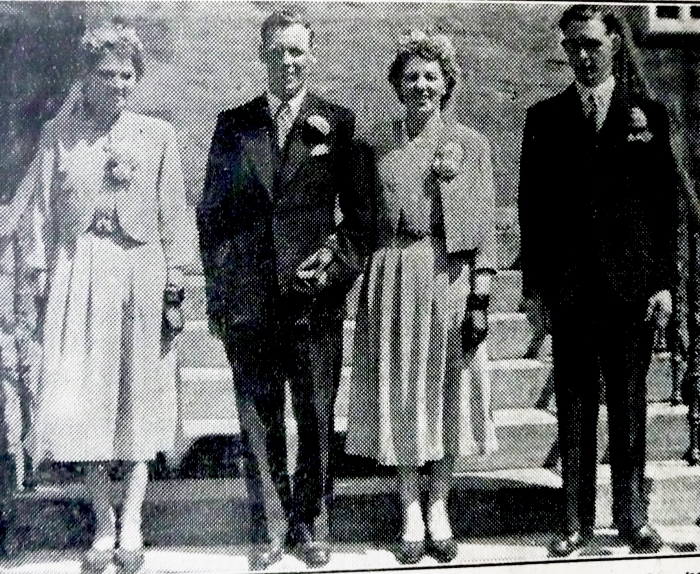 Miss Evelyn Roy and Miss Ena Chisholm were bridesmaids, and Miss Margaret Inglis was trainbearer. Corporal W Willis was best man. Mr Francis Baillie, Market Hill, Gatehouse was married at St Michael's RC Church, West Bromwich, to Miss Helen Plant, Peel Street, West Bromwich. 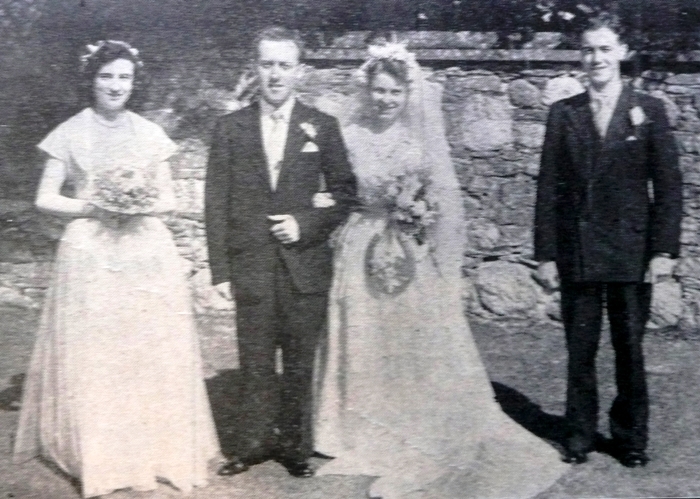 Mr Leo McClymont, Gatehouse, was best man and the bride was attended by Miss Betty Baillie, sister of the bridegroom, and Miss Dorothy Williams, a friend. The two little trainbearers were Susan Taylor and Lynn Stoke, nieces of the bride. The bridal party at the wedding in Anwoth Parish Church of Mr Gavin Gilmour, Boatgreen, Gatehouse, and Miss Catherine Carruthers, Cardoness. 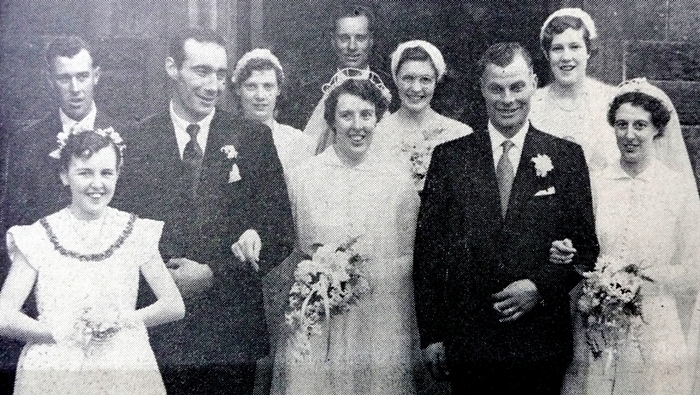 The bride was attended by her cousin Miss Rena Paterson and Miss Jean Gilmour, sister of the groom. Mr James Gilmour, the groom's brother, was best man and the Rev. J Turnbull, MA, officiated. Her two sisters, Nessie & Janet, attended Miss Elizabeth Turnbull Hamilton, Newton Farm, Gatehouse when she was married to Mr Hugh McGowan Blain, Creetown. The service, which was held at Newton Farm, was conducted by the Rev. John Turnbull, the best man being Mr Peter Harvey. 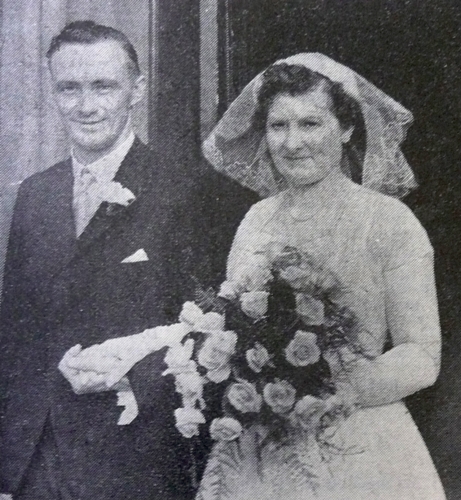 Miss Jane Geddes, of Memory Lane, Gatehouse of Fleet, Kirkcudbrightshire, after their wedding in Dumfries. 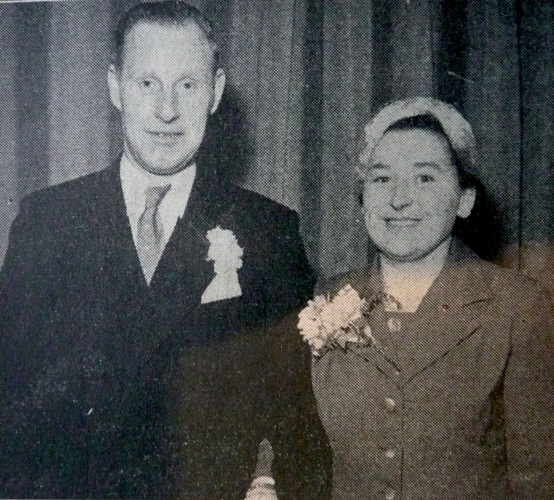 Mr James McInally, Riverbank, Gatehouse, and Miss Margaret J S Couper, Anwoth Hotel, Gatehouse, were married in Anwoth Church. Rev. John Turnbull officiated, with Mrs Turnbull at the organ, and the best man was Mr Colin Bennett, with Mrs Jack Couper, sister-in-law of the bride as matron of honour. Mr William Ireland McNeillie, Kirkcudbright, and Miss Jessie Campbell, 'Fleetvale', Gatehouse were married at Anwoth Church. Rev. John Turnbull conducted the services, with Mrs Turnbull at the organ, and the bride was given away by her father Mr William Campbell. 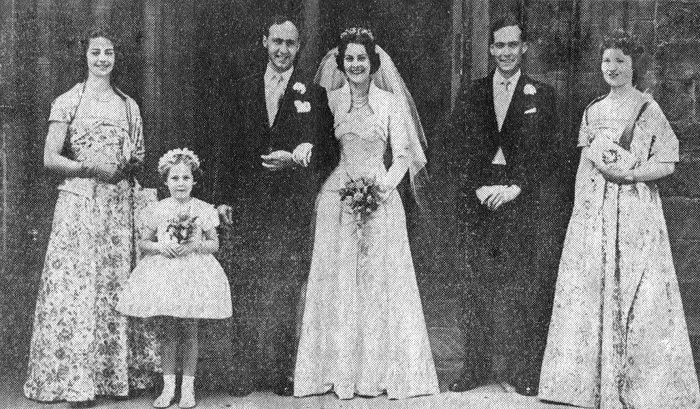 Miss Margaret Campbell, sister of the bride was bridesmaid, and the best man was Mr George McNeillie, brother of the groom. 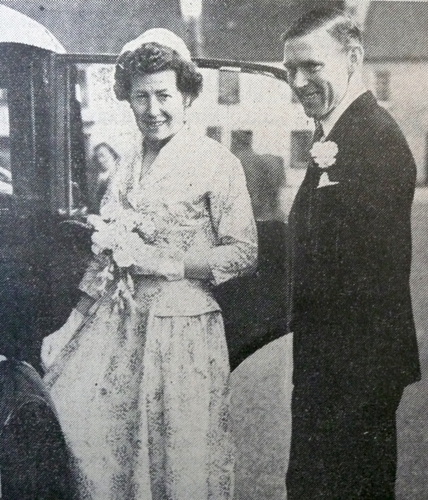 Mr Murray Straiton, Gatehouse, and Miss Anne Kirkpatrick, Dumfries, leaving Maxwellton West Church, Dumfries, after their wedding. 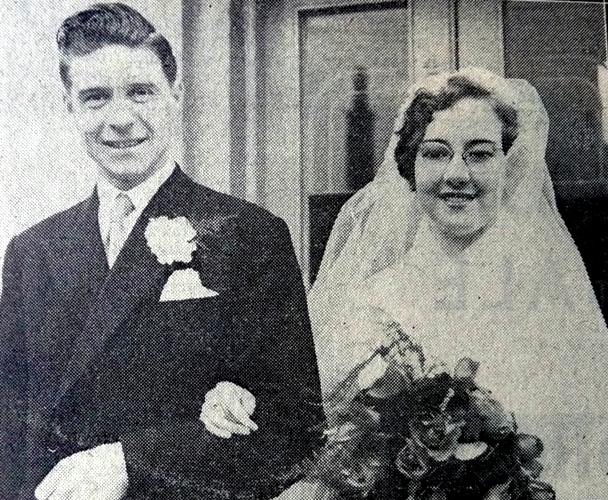 Mr David Cochrane, 20 Catherine Street, Gatehouse, and his bride, Miss Sheila Johnstone, of Dundee, after their wedding in the Gilfillan Memorial Church, Dundee. The bridegroom is studying for his C.A. degree at Dundee. 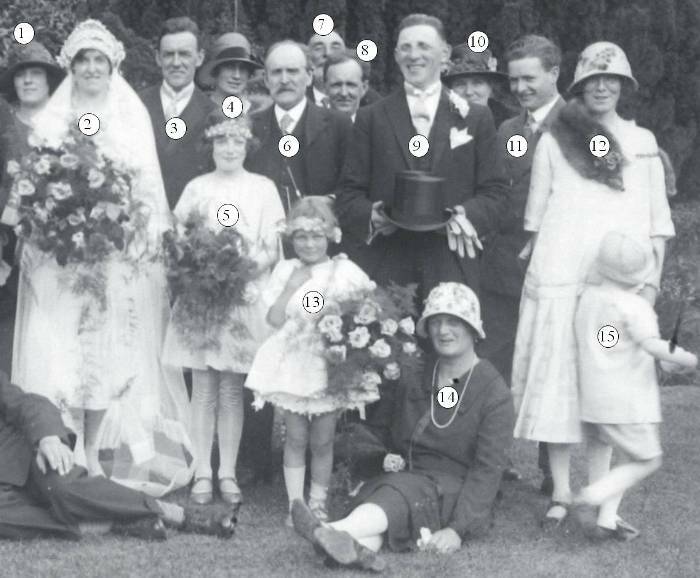 The bridal party at the wedding in Anwoth Church of Mr James Kay Ross, Knowe Farm, Newton-Stewart, and Miss Elizabeth McLaughlan Ferguson, King's Laggan, Gatehouse. Mr Fergus Johnstone and Miss Janet Ferguson (sister of the bride) were best man and bridesmaid and the service was conducted by Rev. John Turnbull with Mrs Turnbull at the organ. The reception was held at the Anwoth Hotel. 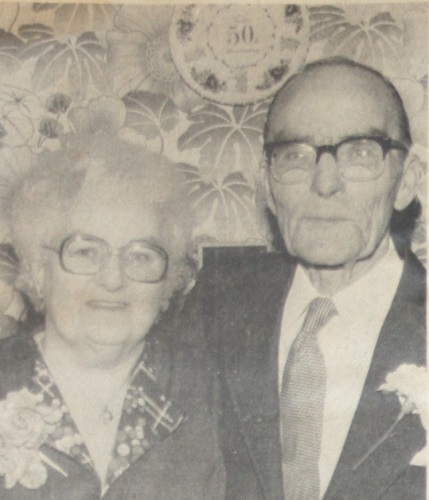 Mr Donald James Fergusson, Glenavon, Gatehouse, and Miss Jessie Edgar Corson, Barmagachan, Borgue, were married in Borgue Parish Church. A sister and a friend, Miss Grace Corson and Miss Janet Dalling, Twynholm, attended the bride. The best man was Mr Alex Hope, Gatehouse. The service was conducted by Rev. W Moore with Miss Payne at the organ. 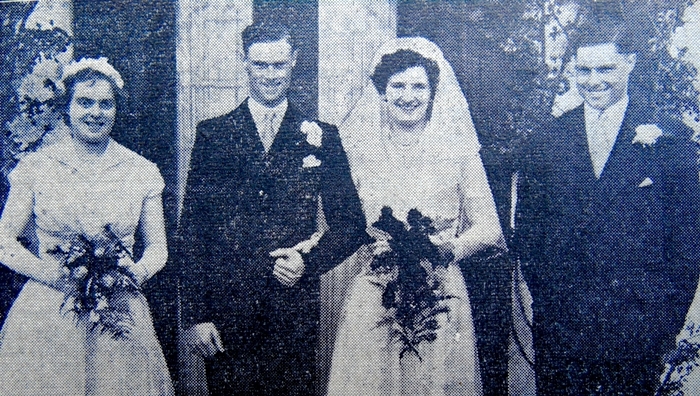 Mr Jack Patterson, Catherine Street, and Miss Kathleen Wilson Cairns, Mile End, both of Gatehouse after their wedding in Girthon Church. The bride was attended by her sister Miss Margaret Cairns, with Master Duncan Grant, nephew of the groom being the trainbearer. Best man was Mr Edgar Patterson, brother of the groom. 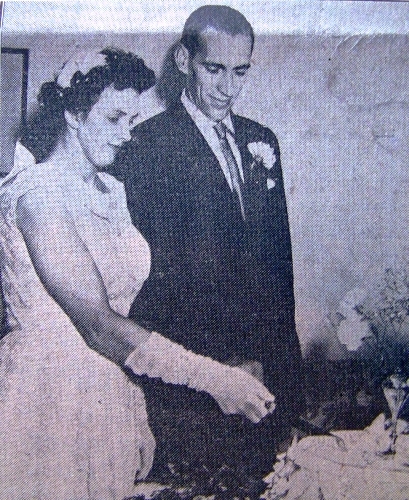 Mr John McInally and Miss Irene Shaw, both of Gatehouse, cut their wedding cake, after being married in Girthon Church. The service was conducted by Rev. J B F Montgomery with Mrs Turnbull at the organ.The best man and bridesmaid were Mr James Thomson, Riverbank, Gatehouse (cousin) and Miss Jean Laidlaw, Hightae, Lockerbie (cousin). 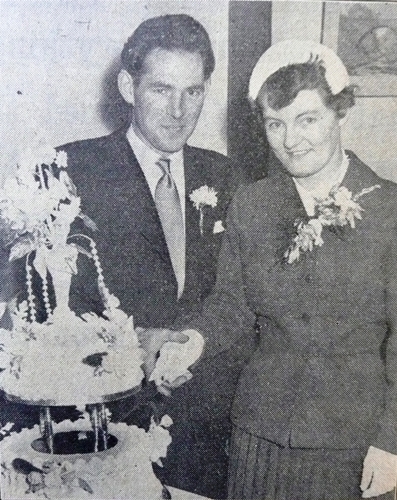 Mr Hamish Holmes, Riverbank, Gatehouse, and his bride, Miss Mary Agnes Hutton, Union Street, Kirkcudbright, cut the cake in the Paul Jones restaurant after their wedding. Rev. 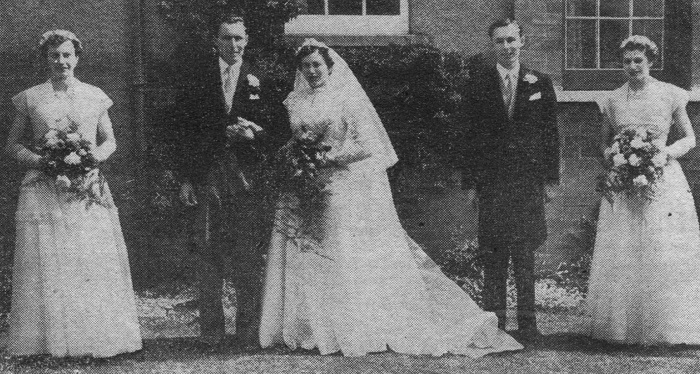 J E Motherwell officiated and the best man and bridesmaid were a brother and sister of the bridegroom, Mr R Holmes and Miss E Holmes. 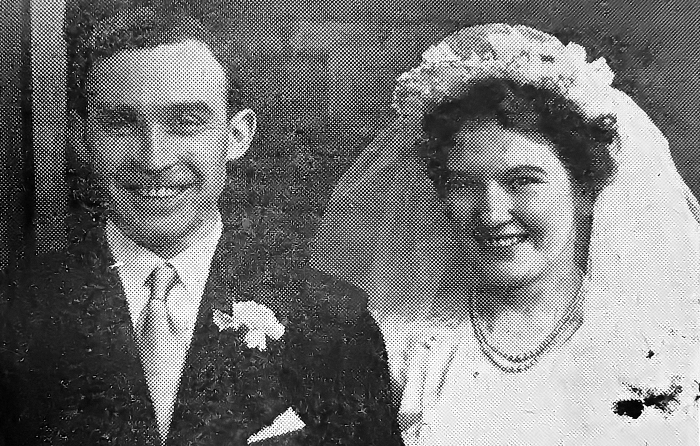 Miss Ruby White, 'Garnie Myre', Rainton Farm, Gatehouse, was married at Girthon Parish Church to Mr Alex McMillan, Riverbank, Gatehouse. 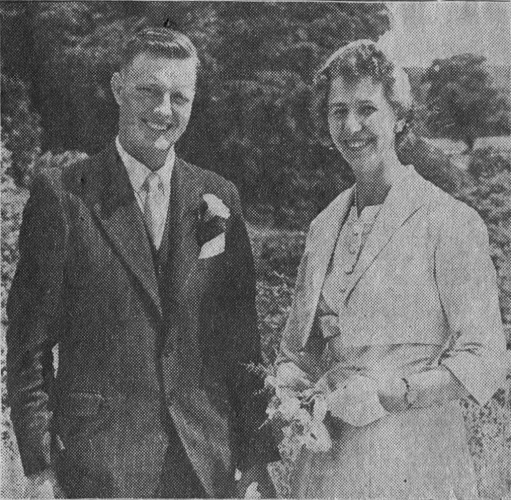 Mr John McMillan, brother, was best man, and the bridesmaid was MIss Betty McLellan, with Miss Jean Walker, niece, as train-bearer. Two sisters attended Miss Margaret Gordon, 34 Riverbank, Gatehouse, when she was married in Anwoth Church to Mr James Nelson, Stewart Terrace, Twynholm. Rev. John Turnbull officiated, with Mrs Turnbull at the organ, and the best man was Mr James Hogg. The brides attendants were Miss Ethel Gordon and Mrs McKill. 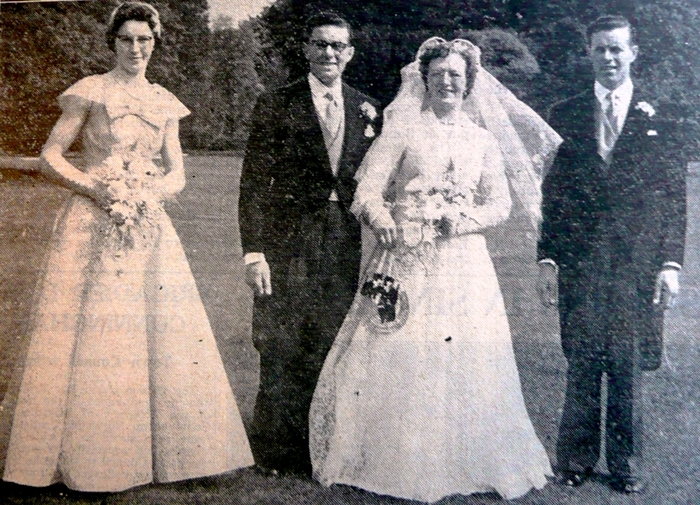 Anwoth Parish Church was the scene for the wedding of Miss Patricia Vivian Stark, Bridge House, Gatehouse, and Mr David Murray Dudgeon, M.A. B.Ed. of Haddington. Rev. John Turnbull officiated with Mr W Main at the organ. 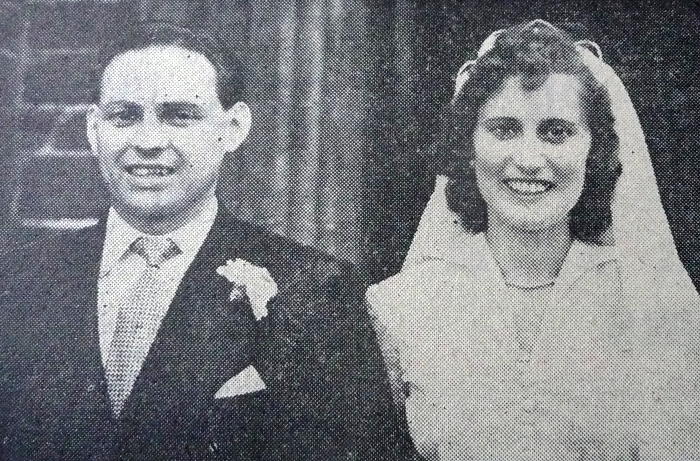 The best man and bridesmaid were Mr George Fortune and Miss Patricia Hamilton. 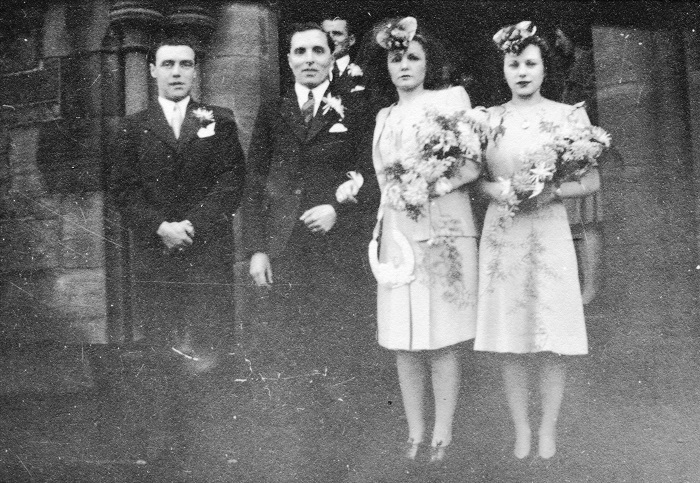 The bridal party at the wedding in the Anwoth Hotel, Gatehouse of Mr Robert Veitch, Girthon Kirk, and Miss Annie Clark Tait, Millmark. Rev. 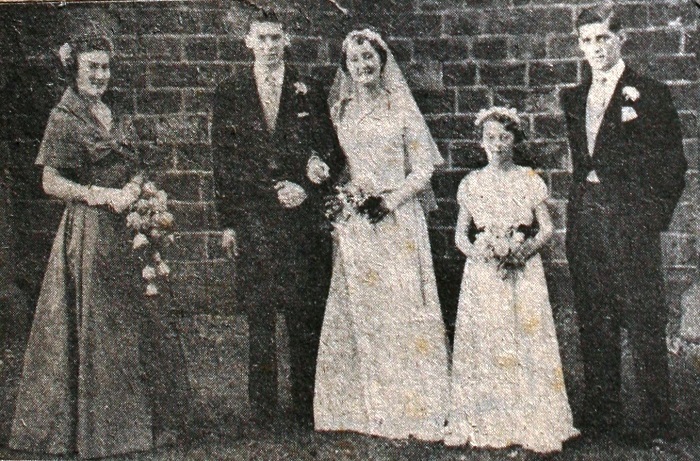 John Turnbull officiated and the best man was Mr John Veitch, brother of the 'groom, with Misses Janet Telfer and Joan Tait, cousins of the bride, as bridesmaids. 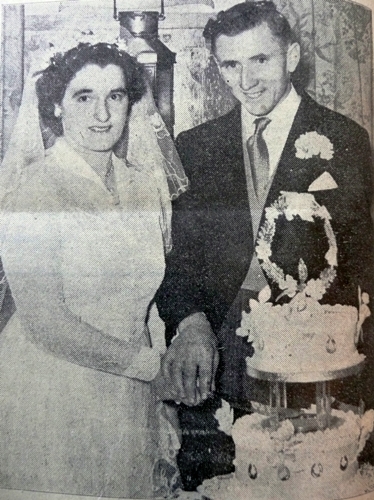 Mr Peter R Blain, Philgown Farm, Mochrum, Wigtownshire, and his bride, Miss Agnes J B Hamilton, Newton Farm, Gatehouse, cut the cake after their wedding in Anwoth Parish Church. Rev. 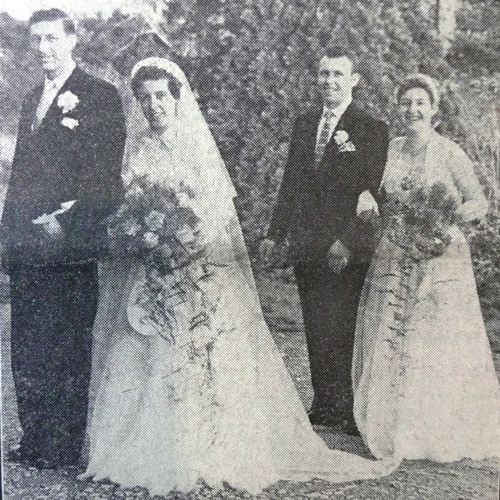 J Turnbull officiated, with Mrs Turnbull at the organ, and the best man and bridesmaid were Mr William Blain and Miss Janet Hamilton, brother and sister of the 'groom and bride respectively. The soloist during the signing of the register was Miss Catherine Veitch. 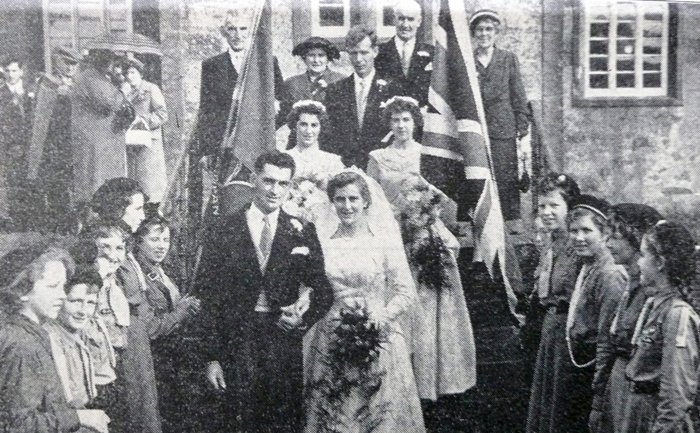 Mr Robert Irvine Holmes, 20 Riverbank, Gatehouse, and his bride, Miss Jeanie Kirk, 11 Fleet Street, Gatehouse, after their wedding in Girthon Church. Rev. 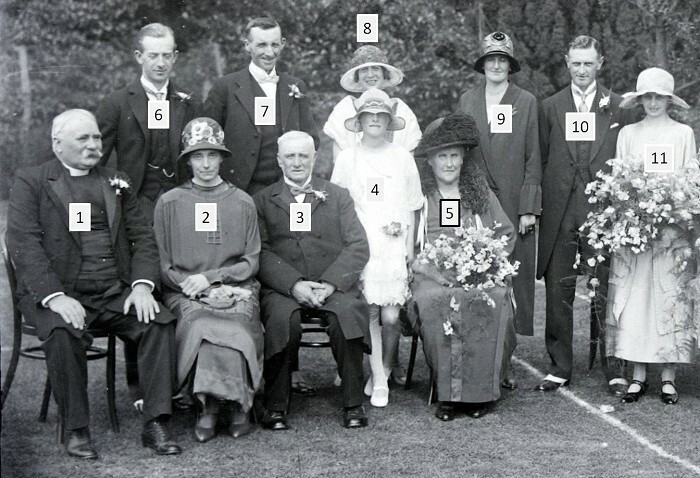 J B Montgomery officiated, with Mrs McClusky at the organ, and the best man and bridesmaid were Mr Hamish Holmes, brother of the 'groom, and Miss Nessie Carson, niece of the bride. 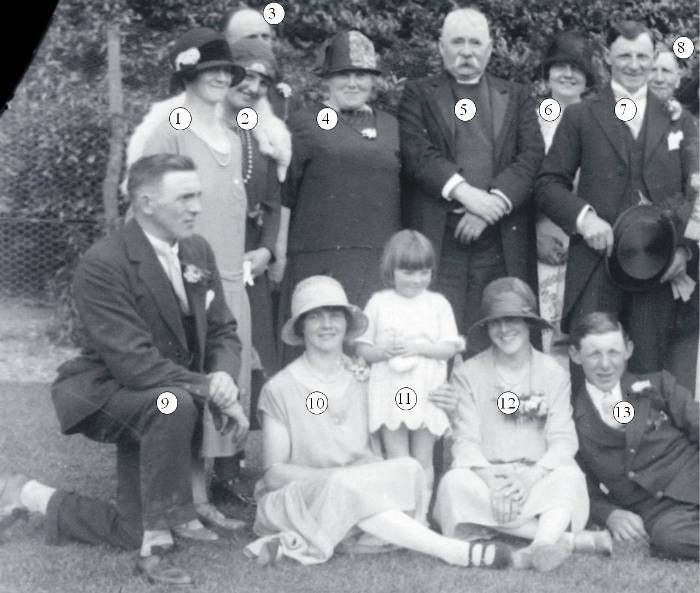 The bridal party at the wedding in Girthon Church of Mr William Joseph Charlesworth, Tottenham, London and Miss Ivy Winifred Cain, 33 Riverbank, Gatehouse. Rev. 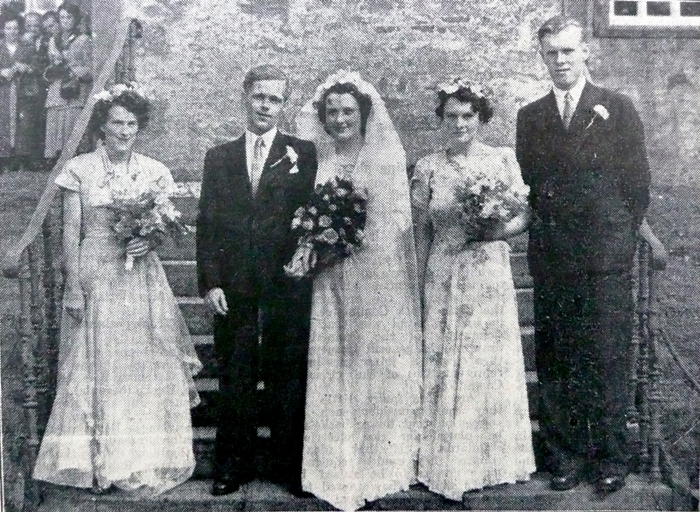 John Turnbull officiated with Mrs [Mc]Gaw at the organ, and the best man was Mr George Charlesworth (brother of the 'groom) with Misses Margaret and Ruth Cain, sisters of the bride, being bridesmaid and tranbearer respectively. 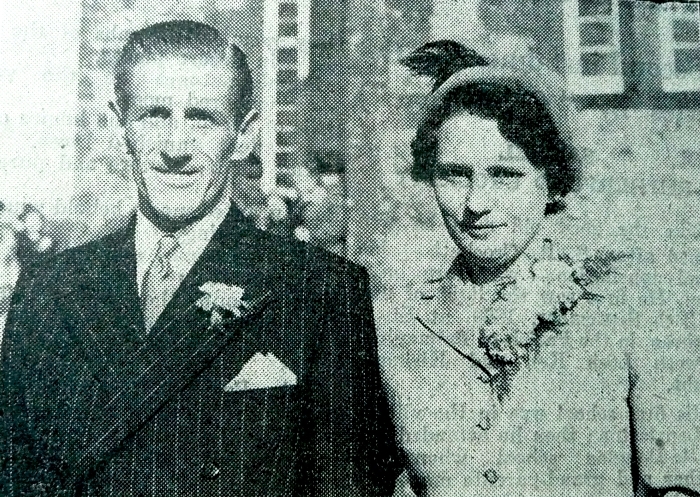 Mr Roy Nisbet, Angel Hotel, Gatehouse, and his bride Miss Betty Copeland, East Logan, Castle-Douglas, after their wedding at Anwoth Church. Rev. 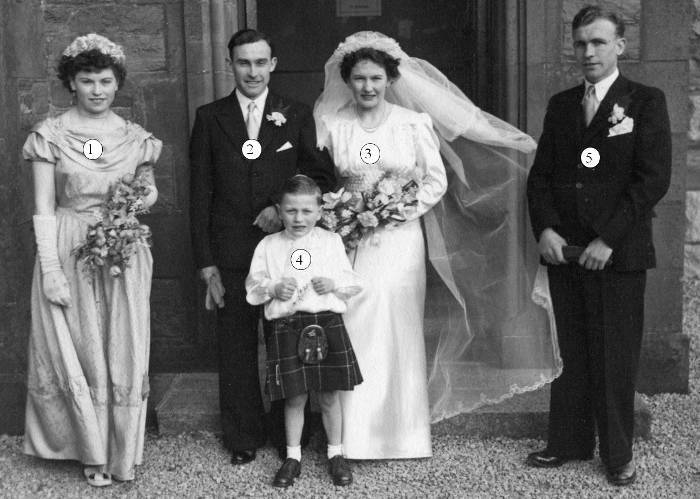 John Turnbull officiated and the bride was attended by her cousin Miss Margaret Copeland, the best man being Mr Donald Clark, Broxburn. Mr John Fisher Scott, Commercial Hotel, Castle-Douglas and Miss Isabella Campbell, 16 Digby Street, Gatehouse, were married in Anwoth Church, Gatehouse. Rev. 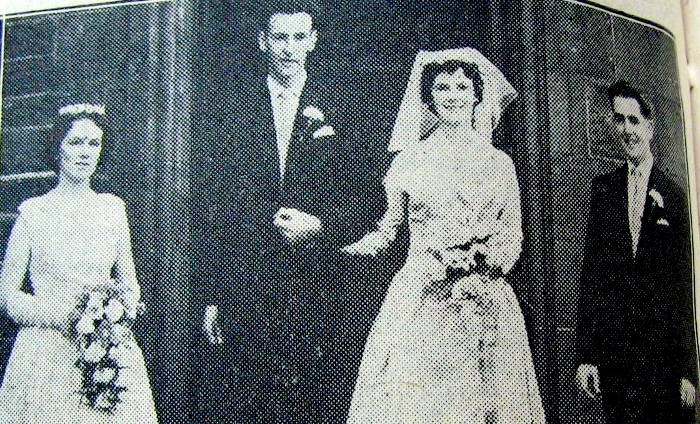 John Turnbull officiated with Mrs Turnbull at the organ, and the best man and bridesmaid were Mr John Monteith and Miss Agnes Dickson. 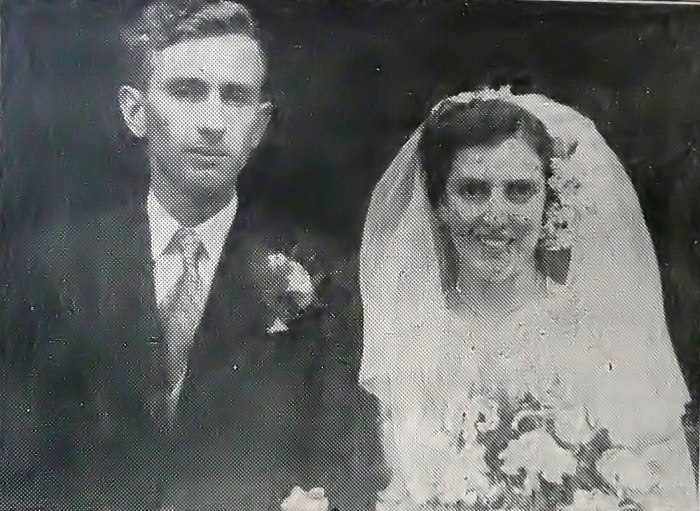 Mr Robert Taylor, Disdow Farm, Gatehouse, and his bride, Miss Mary Elizabeth Andrew Wallace (Betty), Smithy Farm, by Ayr, after their wedding in Coylton Parish Church. The best man was David Taylor, brother of the 'groom with Miss Claire Cunningham as bridesmaid. 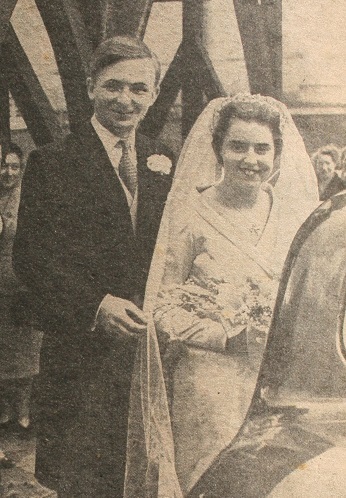 Mr John J Veitch, Girthon Kirk, Gatehouse, and his bride Miss Sadie McMurray, Bengray, Gatehouse, leaving St Mary's Episcopal Church after their wedding. Rev. A W S Holmes of All Saints, Churchill, Oxon, officiated - he was brother-in-law of the bride. He was assisted by Rev. J B F Montgomery. Mr David Veitch, brother of the 'groom, was best man. 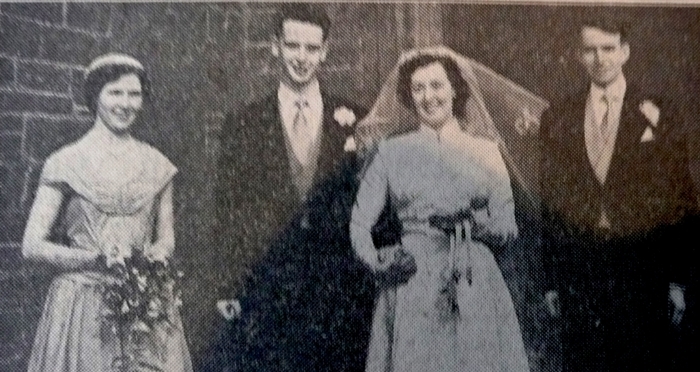 Miss Edith McMurray, sister of the bride was bridesmaid and Mrs McCluskie was at the organ. 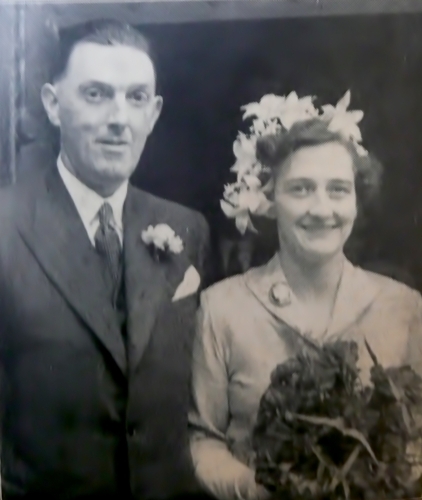 Mr Burns McMyn Gillespie, 138 High Street, Kirkcudbright, and his bride, Miss Margaret Smith Kean, 8 Digby Street, Gatehouse, after their wedding in Girthon Parish Church, Gatehouse. Rev. 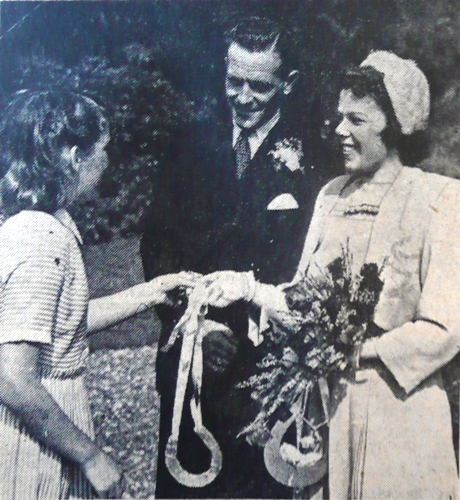 J B F Montgomery officiated and the best man was Mr George Dargavel, with Miss Betty McCulloch, cousin of the bride, as bridesmaid, and Mr John Kean as page. 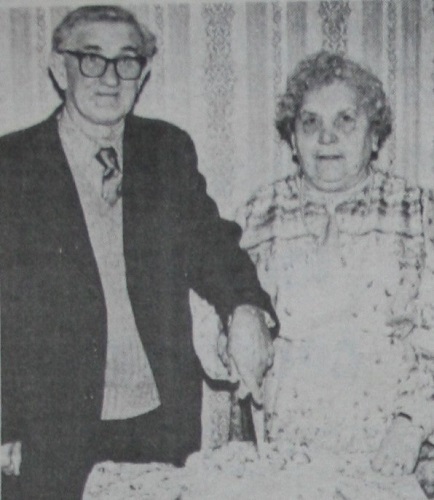 Mr James Fergusson, King's Laggan, Gatehouse, and his bride, Miss Marie McDonald, Glen Road, Palnackie, cut the cake after their wedding in Buittle Church, by the Rev. Campbell Gillon. 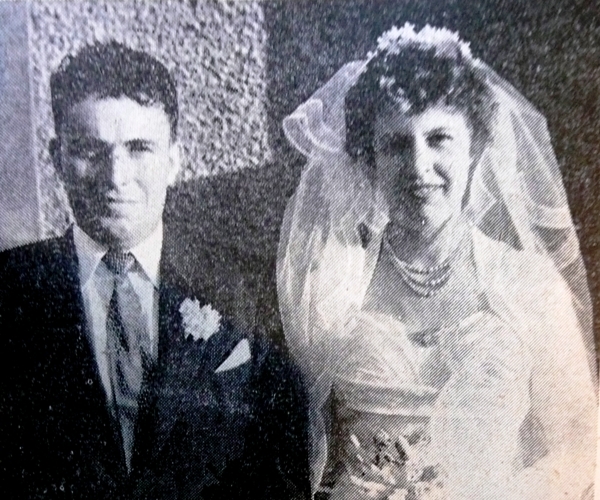 The bride was given away by her grandfather Mr James McDonald and was attended by her sister Miss Flora McDonald. The best man was a brother of the 'groom, Mr Robert Fergusson. Miss Helen McCulloch, infant mistress at Borgue School was married, in Borgue Parish Church, to Mr William Dalrymple of Gatehouse. Rev. W Moore officiated and the best man and bridesmaid were Mr T Dalrymple (brother) and Miss Minnie Wilson. 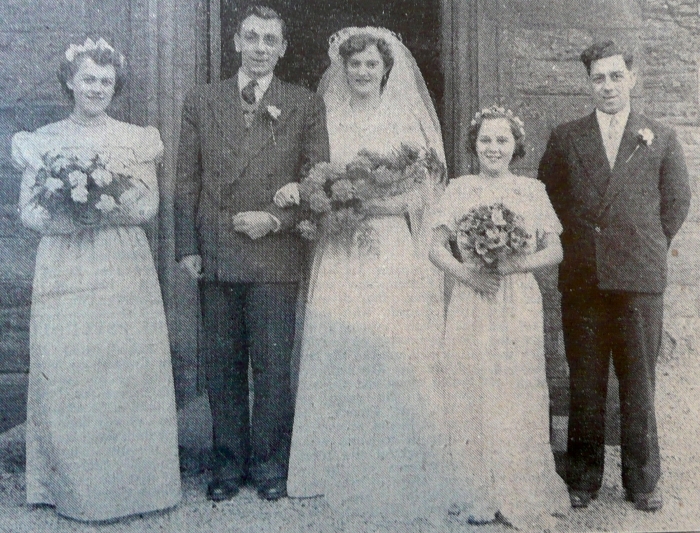 The wedding took place in the Murray Arms Hotel, Gatehouse, of Mr Adam McKnight, Culchronchie, Creetown and Miss Janet Hamilton, Newton Farm, Gatehouse. Rev. John Turnbull officiated and the best man and bridesmaid were Mr Alexander McKnight (brother of the 'groom) and Miss Betty Carson, cousin of the bride. 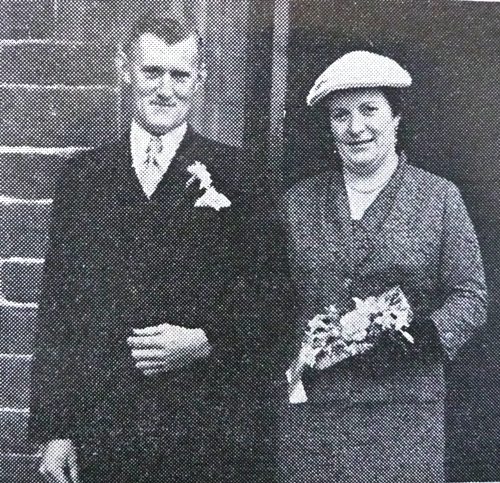 Mr Cameron Patterson, Laggan Mullan, Gatehouse, and his bride Miss Margaret Wright McDonald Hunter, Earlston Lodge, Borgue, after their wedding by the Rev. R Ferrie, in Borgue Public Hall. A brother and a sister of the 'groom were best man and bridesmaid. Miss Helen McIntyre, Barharrow, Gatehouse leaves Girthon Church after her wedding to Mr Robert James Campbell, Digby Street. The service was conducted by the Rev. 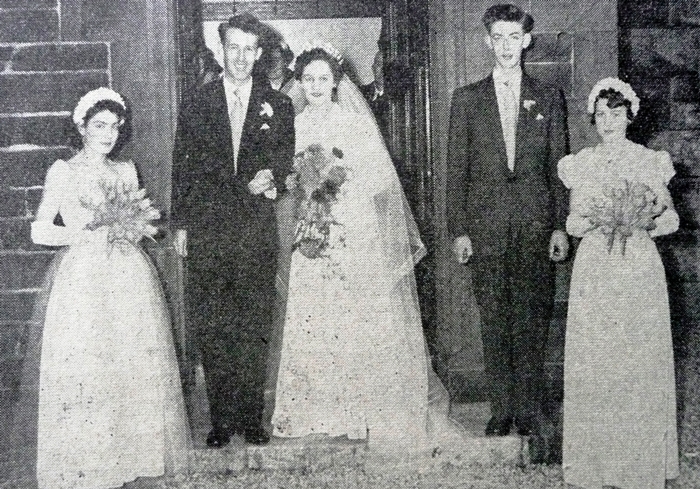 J B Montgomery with Mrs Cluskie at the organ, and the best man and bridesmaid were Mr Allan Campbell, brother of the 'groom, and Miss Margaret Campbell, cousin of the 'groom, with little Annette McIntyre, niece of the bride, as trainbearer. 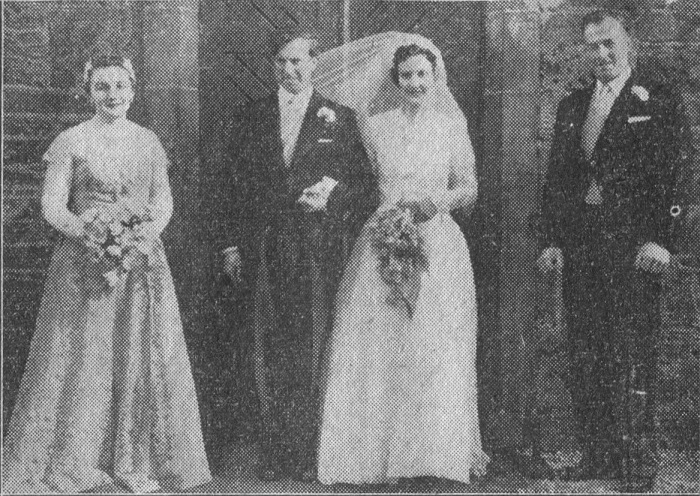 Mr William Nichol, Gatehouse, and Miss Caroline Cantlie, Minnigaff, were married in Kirroughtree House Hotel, Newton Stewart, and are seen in the photograph with the best man and bridesmaid, Mr Ewan Patterson, Gatehouse and Miss Elizabeth Cantlie, Minnigaff (sister of the bride). 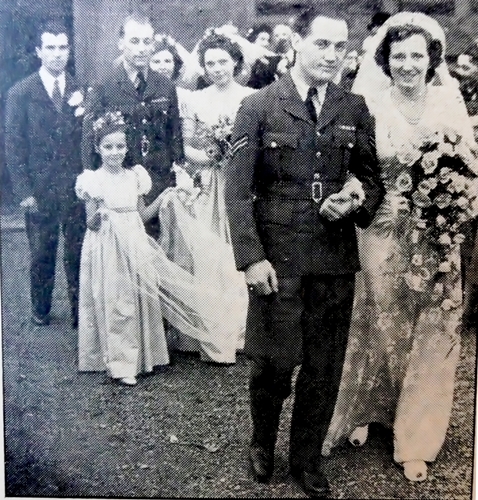 The wedding took place in Girthon Parish Church of Mr Andrew Quinney, an RAF gunner-instructor from Edinburgh, and Miss Margaret Cain, Riverbank, Glasgow, The Rev. J B F Montgomery officiated, with Mrs McClusky at the organ. 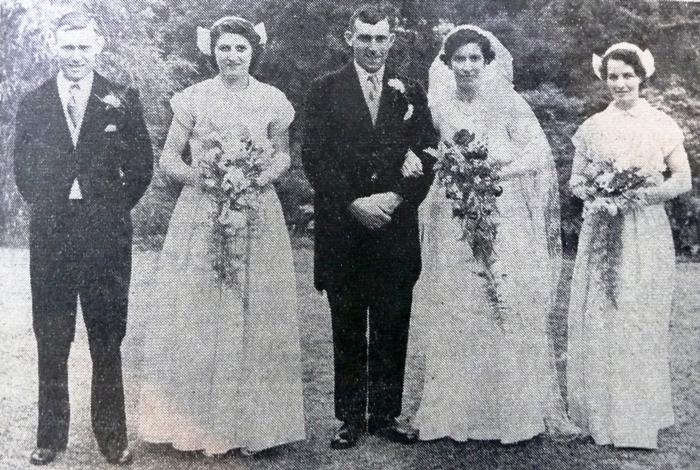 The best man and bridesmaids were MrWilliam Quinney, brother of the 'groom, and Misses Beryl Scott and Ruth Cain, cousin and sister of the bride respectively. Members of Gatehouse School Choir led the praise at the wedding in Girthon Church of Miss Catherine McCulloch Cowan, local schoolteacher to Mr Herbert Renwick, Castlehill, Moniaive. The service was conducted by the Rev. J B F Montgomery. 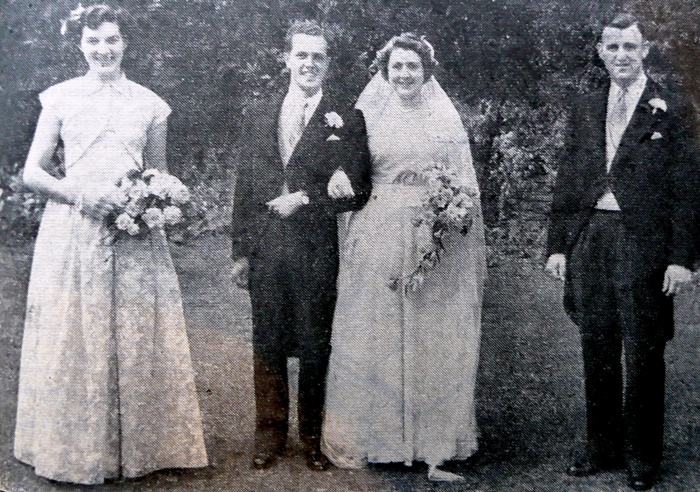 Mr John R Campbell, Criagnell, New Galloway, and his bride, Miss Shirley M Cameron, Riverbank, Gatehouse, after their wedding at St. Mary's RC Church, Gatehouse. 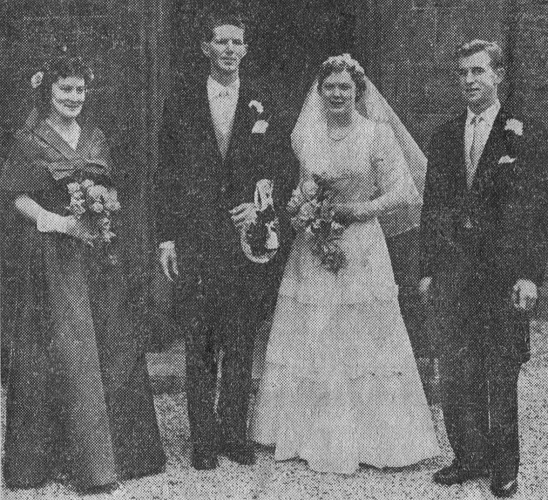 Father H Donnolly officiated, with Mr John Trainer at the organ, and the best man and bridesmaid were Mr Thomas Campbell (brother) and Miss Margaret Cameron (cousin of the bride). Twynholm Church was the scene of the wedding on Tuesday of Miss Grace Findlay Sloan, Redfield Farm, Twynholm, and Mr James Wallace Taylor, Disdow Farm, Gatehouse of Fleet......Sisters of the bride Misses Sheena and Moyra Sloan were the bridesmaids......Mr Robert Carson discharged the duties of best man. 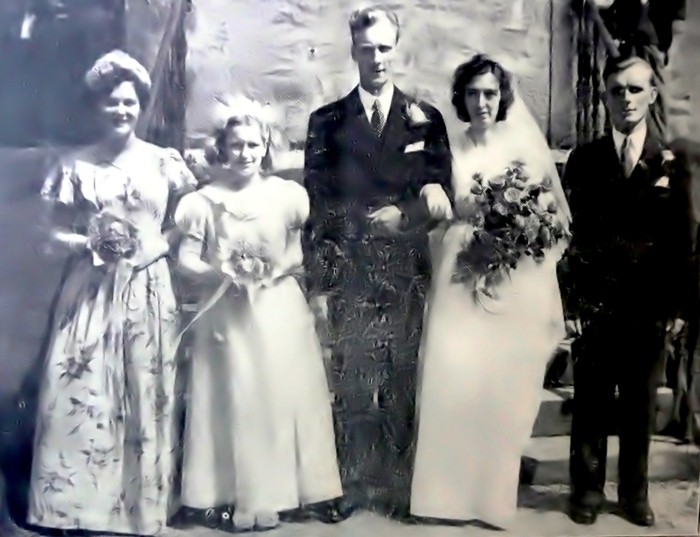 Miss Annie-Margaret Reid Sloan, Redfield, Twynholm and Mr William Johnstone, Culreoch, Gatehouse of Fleet, were married in Twynholm Church on 18th May......In attendance as bridesmaids were the brides sisters, the Misses Sheena and Moyra Sloan......Mr Robin Johnstone was the best man. The wedding took place in Girthon Parish Church of Mr Robert Carson, Conchieton Farm, Twynholm, and Miss Janet Shaw Taylor, Disdow Farm, Gatehouse. Rev. J B F Montgomery officiated, assisted by the Rev. John Good, Twynholm, and the best man and bridesmaid were Mr John Carson, brother of the 'groom, and Miss Janet Wilson. Miss McCluskie was the organist. 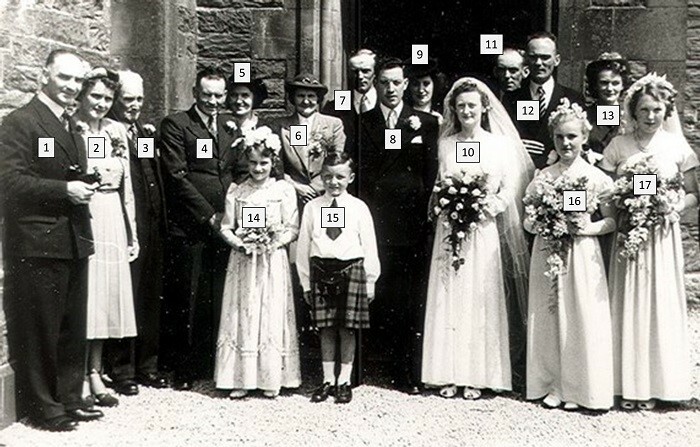 The wedding took place at Girthon Parish Church of Mr James Hall, Roadside Cottage, Walkerburn, Peeblesshire, and Miss Sheila McMillan, Laghead, Gatehouse. The Rev. J B F Montgomery officiated wth Mrs McCluskie at the organ. 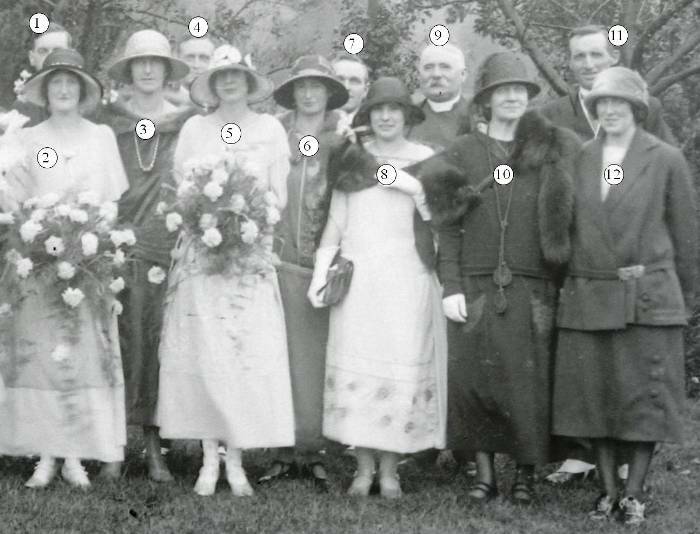 The bridesmaids were Miss Elizabeth McMillan, sister of the bride, and Miss Isobel Knox, cousin of the 'groom. Mr Colin Hall, cousin of the 'groom was best man. 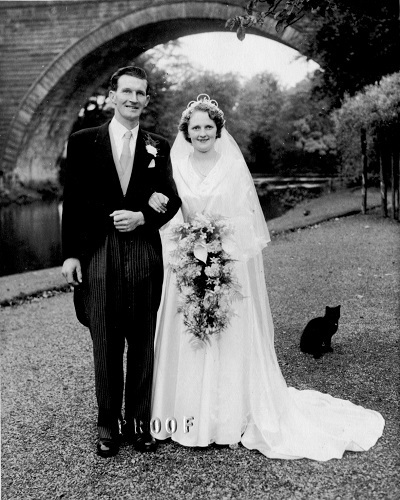 Mr Robert M Johnstone, Holecroft, Gatehouse, and his bride, Miss Catherine Veitch, Girthon Kirk Cottage, after their wedding in the Murray Arms Hotel by the Rev. J B F Montgomery. 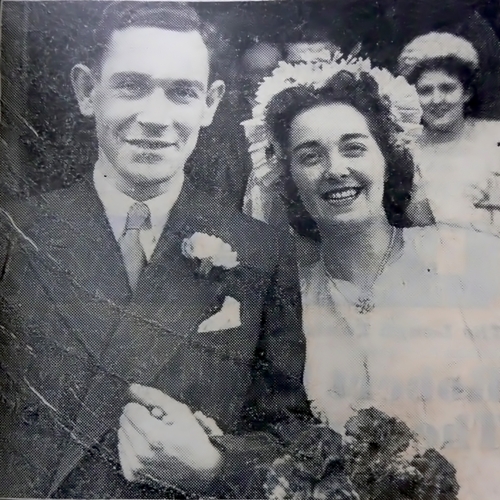 Mr David Johnstone, brother of the 'groom, was best man, Mrs D P K Howie, sister of the bride, was matron of honour, and the bride was given away by her brother, Mr Jack Veitch. 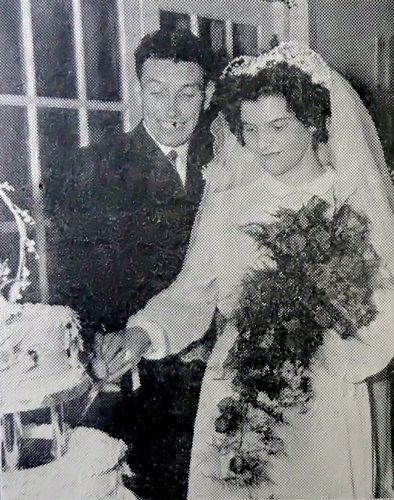 Mr Adam Martin, Springholm, and his bride, Miss Margaret Manson, Cally Mains Cottage, Gatehouse, after their wedding in Girthon Parish Church. The Rev. J B F Montgomery officiated with Mrs McGaw at the organ and the bride was given away by her father and attended by her sister. The best man was the brother of the 'groom. 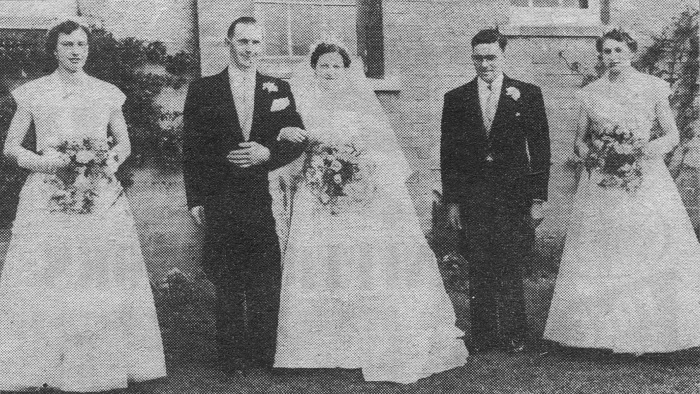 Two Gatehouse sisters Miss Janet and Miss Margaret Kirkpatrick, Enrick Cottage, were the brides at a double wedding at Girthon Parish Church, the bridegrooms being r(espectively) Mr David Maxwell, High Clachan, Castle Douglas, and Mr James Smith, Gaitgil Lodge, Gatehouse. The Rev. J B F Montgomery officiated with Mrs McCluskie at the organ. The elder sister, Miss Janet, was attended by Miss Jean McWilliam and Miss Betty Kirkpatrick (cousin). Mr Hector Maxwell, brother of the 'groom was best man. 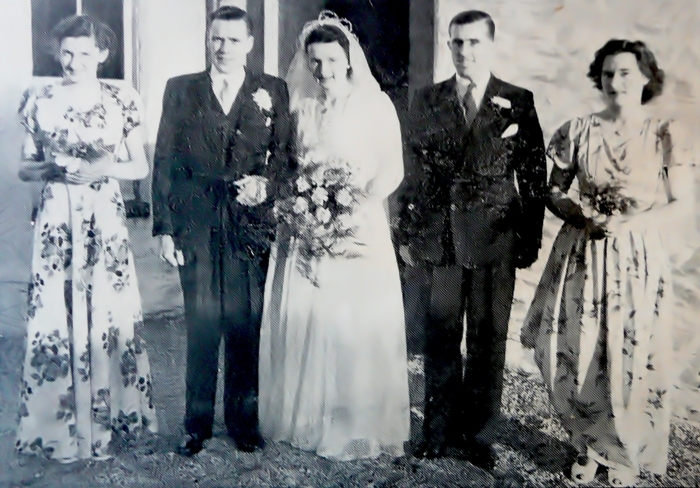 Miss Margaret was attended by Miss Betty Geddes (cousin) and Miss Anne Kirkpatrick (sister)and best man was Mr Thomas Kirkpatrick, twin brother of the bride. The wedding took place at Twynholm Parish Church on Saturday of Mr John McCulloch, Glentoo, Bridge of Dee, and Miss Agnes Carter, Greenslack, Gatehouse. 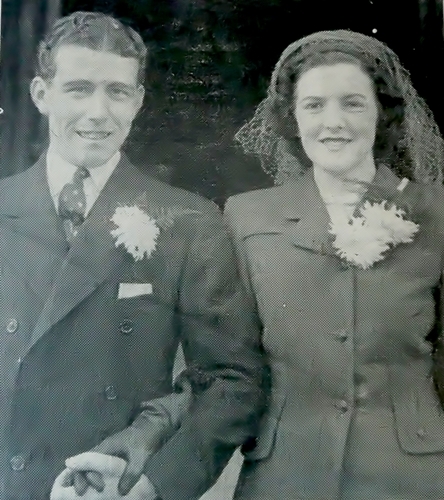 A cousin of the bride, Miss Agnes Robson, was bridesmaid and the best man was Mr N H McCulloch, brother of the 'groom. 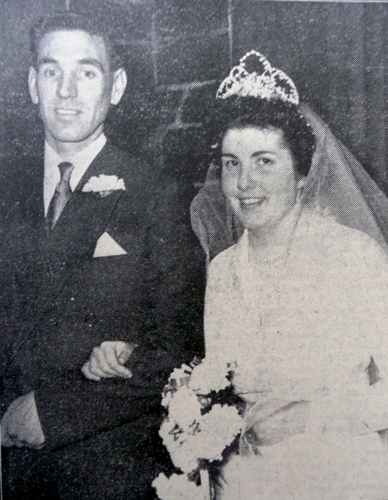 Above : Miss Sheila G Crosbie, a Gatehouse schoolteacher, recently employed in Edinburgh, was married in Girthon Parish Church to Mr Frederick Stark of Edinburgh. 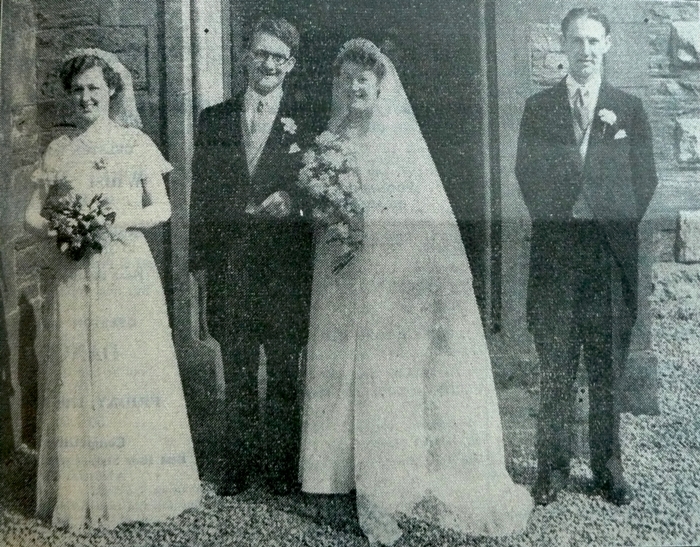 Left : James Neil Murray Usher & Sara Younger, married at St. John's Episcopal Church, Jedburgh. The bridal party at the wedding in St Cuthberts Church, Kirkcudbright of Mr Robert Hannah Crosbie, Gatehouse, and Miss Margaret McGowan, Torrs Dairy, Kirkcudbright. 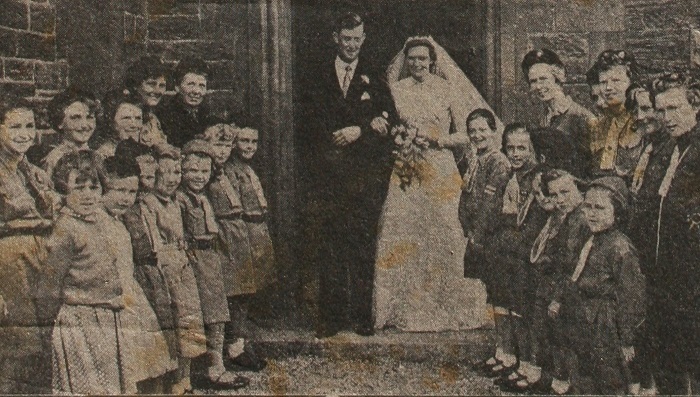 Local Girl Guides formed a guard of honour for Miss Elizabeth Proudlock, Riverbank, Gatehouse when she was married in Anwoth Church to Mr Robert T Hamilton, Newton Farm, Gatehouse. The service was conducted by Mr J Turnbull with Mrs Turnbull at the organ. 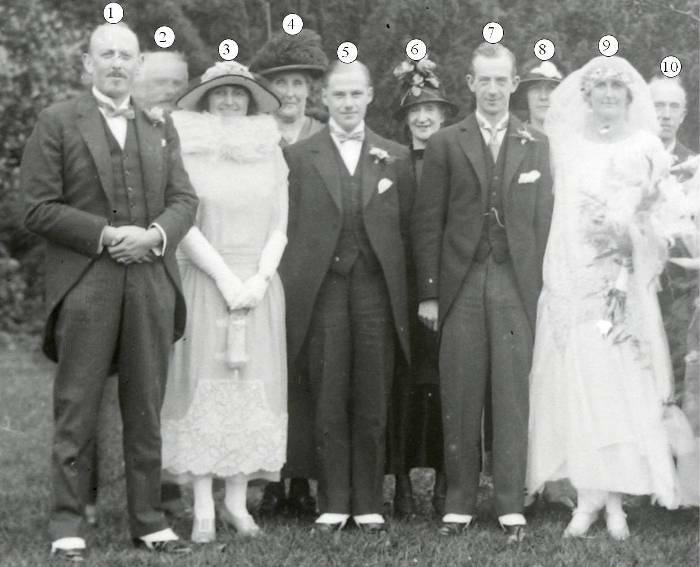 The bridal party included Mr R G Williamson (cousin) as best man, and Miss Mabel Proudlock (sister) and Miss Netta Ruxton as bridesmaids. Mr Robert McCulloch, 5 Market Hill, and Miss Mary Tinlin, Deer Park, both of Gatehouse, were married by Rev. J Turnbull in the Murray Arms Hotel. 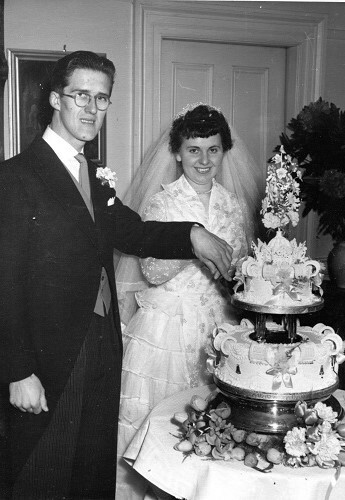 The bride was attended by Miss Alice Black and the best man was Mr R Laurie, cousin of the 'groom. 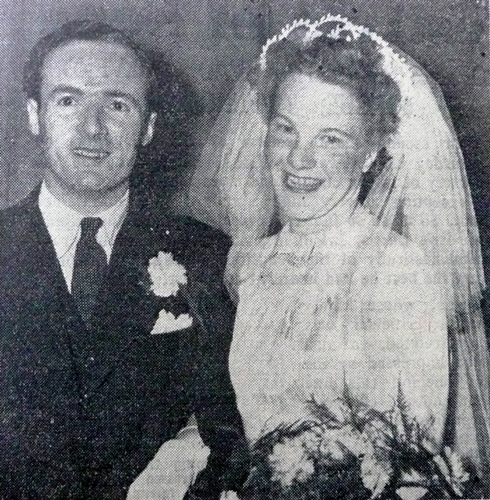 The wedding took place in Girthon Parish Church of Mr Robert W Parley, Tannoch, New Galloway, and Miss Margaret J McKie, Cally Mains, Gatehouse, Rev. J B F Montgomery officiated with Mrs McCluskie at the organ and the best man and bridesmaid were Mr Mackintosh and Miss Catriona McKinnon. 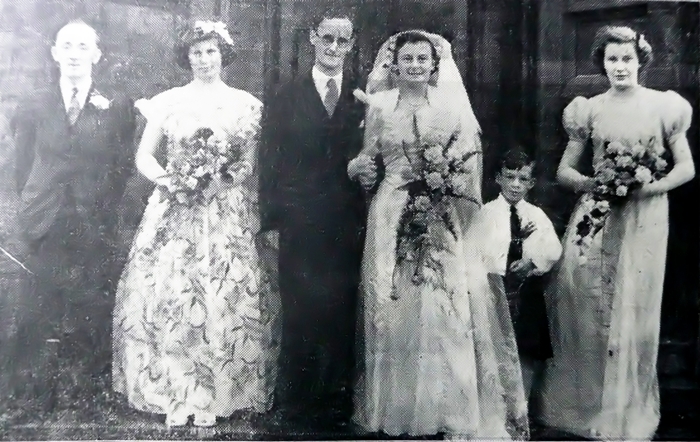 The bridal party at the wedding in St. Cuthbert's Parish Church, Kirkcudbright, of Mr Donald Macintyre Henry B.Sc., A.M.I.E.E., Craigie Barns, Gatehouse, to Miss Mary Grace Anderson, 16 High Street, Kirkcudbright. 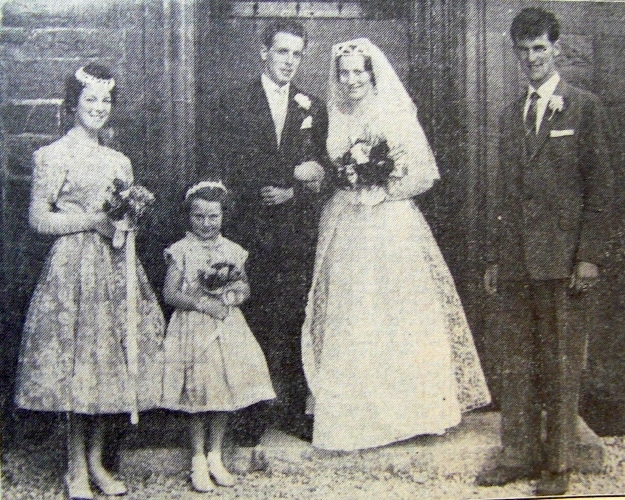 Attending the bride were Miss Jane Mitchell,cousin, Miss Heather Nicolson, cousin of the 'groom and flower girl Mary Mitchell. Best man was Mr Alastair W Henry, brother of the 'groom. 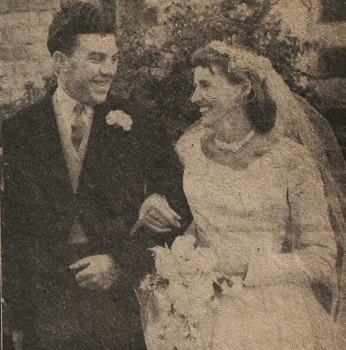 The wedding took place in Girthon Parish Church, Gatehouse of Mr David Wallace Taylor, Disdow Farm, Gatehouse, and Miss Anne Laurie Crosbie, 69 High Street, Gatehouse. 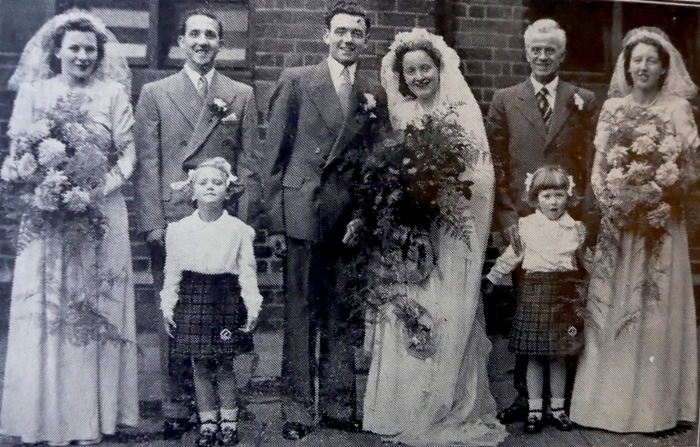 Mrs McCluskie was the organist, best man was Mr James Prentice and bridesmaid was Miss Audrey Crosbie (sister). 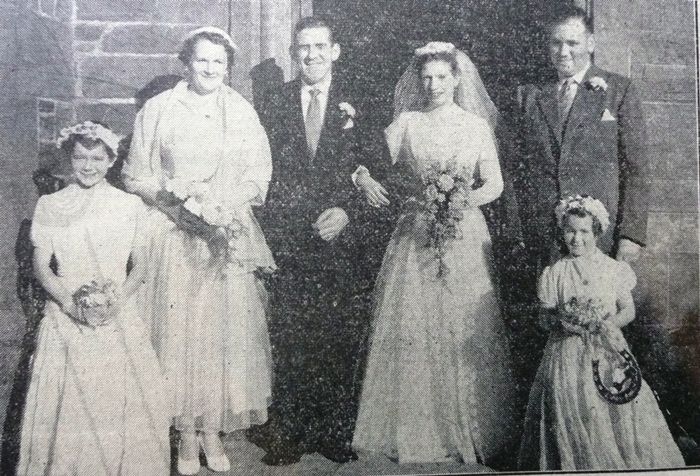 The bridal party at the wedding in St Cuthberts Church, Kirkcudbright of Mr Donald Macintyre Henry, Craigie Barns , Gatehouse, to Miss Mary Grace Anderson, 16 High Street, Kirkcudbright. Attending the bride were Miss Jane Mitchell, Miss Heather Nicholson (groom's cousin), and flower girl was Miss Mary Mitchell. Best man was Mr Alastair W Henry, groom's brother. Brownies formed a Guard of Honour when their Tawny Owl, Miss Jean McWilliam, Littleton, Gatehouse, was married in Girthon Parish Church to Mr Robert Davidson, Kirkbride, Gatehouse. 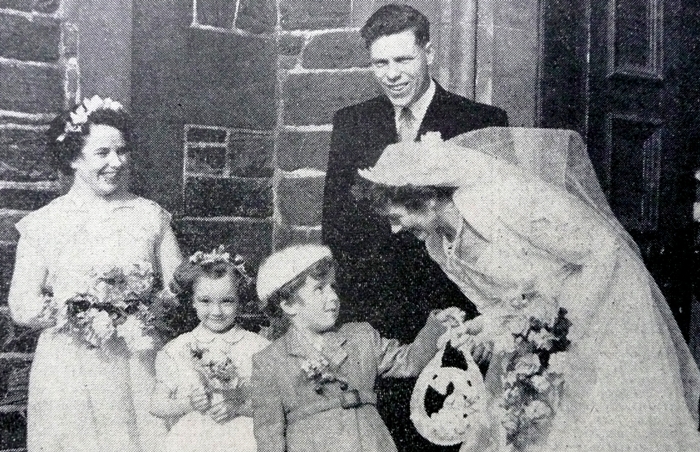 Miss Jane Gilmour, Boatgreen, a former Gatehouse gala queen and sister of this year's queen, was married in Girthon Parish Church to Mr Ian R Murray, 'Whinstone', Cotton Street, Castle-Douglas. Rev. J B F Montgomery officiated with Mrs T H McGaw at the organ, and the best man and bridesmaid were Mr T Wallace and Miss Margaret Gilmour, the bride's sister. 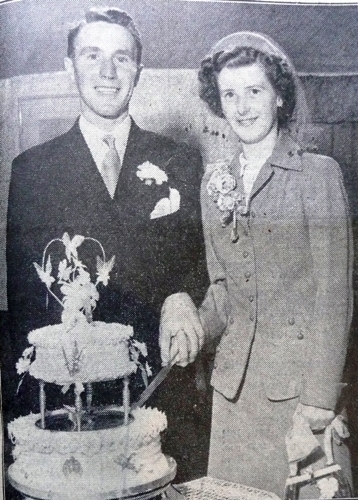 Mr James Erskine Paul, of Balerno, and his bride, Miss Morag Heron, 53 Catherine Street, cut the cake after their wedding at Anwoth Parish Church. The service was conducted by Rev. John Turnbull with Mrs Turnbull at the organ. 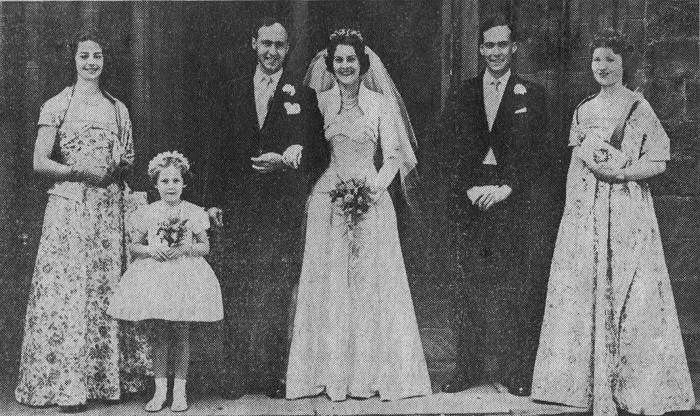 The best man and bridesmaid were Mr David Syme, brother-in-law of the 'groom and Miss Muirhead. Mr William Taylor, Disdow, Gatehouse and Miss M Wilson, Kirkmabreck, were married at Kirroughtree Hotel.